NO WAY: What Types of Countries Have Military Parades ? 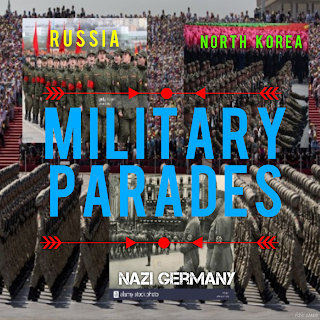 It's not like America's never had a military parade but it was mostly after we won some war , don't remember winning one lately. Nope this one is for Trumps ego and his insecurity over his manhood. He saw a Military Parade and he has to top it with a bigger one. Plus yes he see's himself as a dictator like his idols Adolf Hitler, Putin ,and the leader of Turkey. He loves dictators who can get away with anything , waste there countries money on foolish garbage that does nothing for he people they lead. The Money for this monstrosity could better be used caring for the Veterans who risked there lives and health for this country. Like his weekly vacations costing millions each time , Like millions to add a new whatever to Airforce one, and now to placate his massive ego Millions going towards a totally waste of time Military Parade for no better reason then Trump wants it. Trumps government is borrowing more then Obama's ever did, putting us deeper and deeper in the hole. Now with his stupid really not necessary taxes cuts that has been accelerated. Inflation is coming , higher prices are coming and those tax cuts will disappear having to be spent to cover an increased cost of living. In the end nothing gained in fact it will end up being a negative gain.